In large bowl, stir all ingredients except Toppings with wire whisk until well blended. Heat nonstick griddle to 375 degrees. or 12-inch skillet over medium-high heat. (To test griddle, sprinkle with a few drops of water. If bubbles jump around, heat is just right.) Brush with vegetable oil if necessary or spray with cooking spray before heating. For each pancake, pour slightly less than 1/4 cupful batter onto hot griddle. Cook 2 to 3 minutes or until bubbly on top and dry around edges. Turn; cook other side until light golden brown around edges. 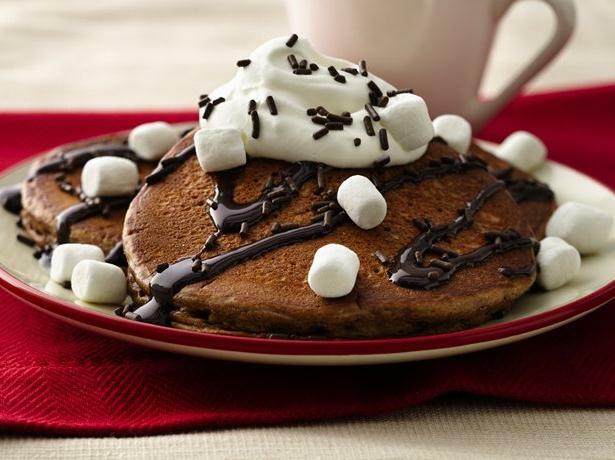 Drizzle pancakes with chocolate-flavor syrup; top with whipped cream. Sprinkle with marshmallows and chocolate candy sprinkles.